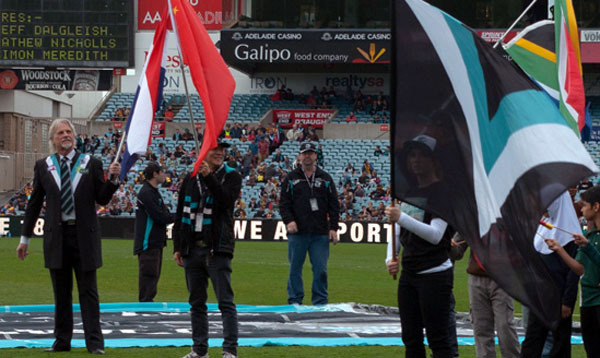 The Port Adelaide Football Club was again very proud to be associated with AFL Multicultural Round on the weekend which provided an opportunity to highlight our club’s partnership with V.I.P. Home Services and our community programs delivered by Power Community Ltd.
AFL Multicultural Round promoted ‘many cultures, one game’ and highlighted how Australia’s greatest game has opportunities for everyone. V.I.P. Home Services was established by Bill Vis, a migrant, who was selling vacuums door-to-door and noticed an opportunity to offer lawn mowing services to the homes he was visiting. The V.I.P. empire was born and V.I.P. Home Services are now a Joint Major Partner with the Port Adelaide Football Club. Bill is also very supportive of the multicultural programs delivered by Power Community Ltd, who are taking the game of AFL to new communities. PCL have a six-week program for primary school students who are new to Australia and excited about everything the great game has to offer. PCL have a program for the African community at Kilburn that has been embraced by teenage girls who train twice per week and play every Friday night. PCL have also established the International Student Supporter Group for tertiary students studying in Adelaide. Many of the students from our programs joined staff from V.I.P. Home Services and our community partners at AAMI Stadium on Saturday to celebrate AFL Multicultural Round. Some students had a kick on the famous turf, or proudly paraded the boundary waving a flag. Others attended a pre-game function to hear the Bill Vis story, his passion for Ice Hockey and his support of the AFL.